On Thursday, Apple CEO Tim Cook once again secured a position on Time magazine's annual list of the 100 Most Influential People, and was praised in a profile written by Democratic Congressman and civil rights activist John Lewis. Lewis wrote that Cook has brought Apple to "unimaginable profitability" and "greater social responsibility" at the same time. He claimed that Cook is "unwavering" in supporting personal privacy, while also actively advocating for LGBT rights, and "leaving our planet a little cleaner and a little greener" by instituting renewable energy programs for the company's US offices and datacenters. The company is working on making all of its US facilities powered by renewable energy, primarily solar. 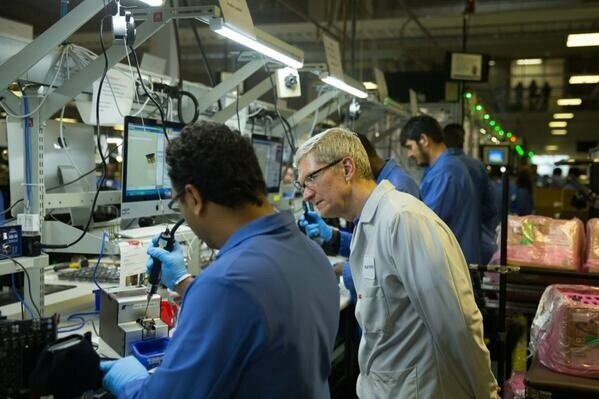 That is just 2 percent of the company's carbon footprint, but Apple has defended itself by saying that 70 percent of its footprint stems from facilities it doesn't own, and that another 22 percent is produced by customers. "Tim Cook is proof that even the most successful companies can and should be judged by more than just their bottom line," Lewis concluded. Apple has taken flak for privacy and LGBT issues in some cases as well. Although the company is one of a number of businesses that have called for an end to bulk data collection by the US National Security Agency, documents leaked by Edward Snowden show that Apple is a partner in that surveillance, whether willingly or not. Cook has been called a "hypocrite" for his LGBT stance by conservative critics, who note that Apple continues to sell products in countries where gays and lesbians can be imprisoned or executed. Elsewhere in the Time piece, lead Apple designer Jony Ive wrote a profile for Airbnb CEO Brian Chesky, in which he said Chesky has an "obsession with detail and practicality" helps make "what could so easily be noble but abstract ideas functional and real."